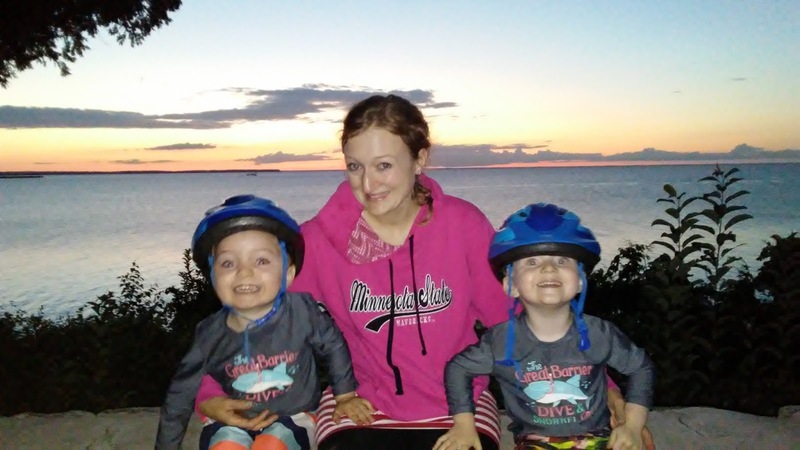 We decided to take a bike ride on Sunset Ttail from our campsite at Nicolett Bay campground. 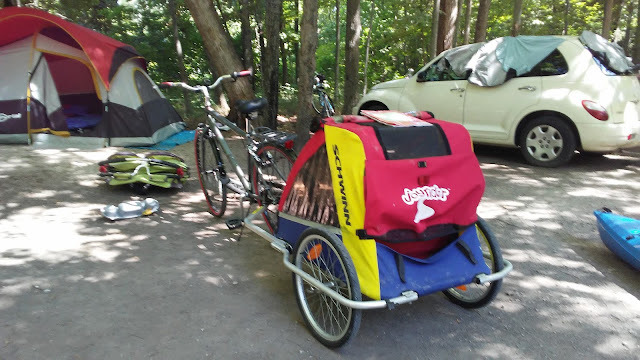 I attached a bicycle trailer to my new huffy bike. We loaded the boys in it with their cool blue bike helmits secured to their heads. It was a hard packed trail with smaller rocks and a few rocks to ride around. I thought to myself that the trail reminded me of the Highline Trail in Glacier National Park with Green Bay subsituting for Lake McDonald even though the Highline Trail doesnt run beside Lake McDonald. Anyway it was a nice easy stroll. My Huffy had issues as I approached Middle Road . I couldnt get up a small steep hill with 60 plus pounds on the trailer so I had to walk up. It was a bit ackward, but I managed. Ellie didnt have her breaks properly adjusted, so she was a bit nervouse on hills and took an appropiate amount of caution walking in places or utilizing her feet to slow herself. We saw cliffs, water, turkeys, and excersise to be had by all.